The woman holding up the so-called "Abacus sign" at the Occupy Wall Street demo has been identified. Her name is Caitlin Curran and here (again) is the famous picture of her holding her sign. The picture has had career adverse impacts on Caitlin. She was a journalist at The Takeaway and the picture got her fired. There is currently a tendency of non-right-wing news outlets to enforce a rigorous non-advocacy position on their staff - and they will fire them for any political donation or any political involvement. Caitlin wrote about this in Gawker. The right-wing news outlets don't enforce that - just look at the roster of Fox News. This is ridiculous. The managing director Mark Effron is enforcing a standard that is philosophically indefensible but he is too brain-dead to see it. If you would have then you are evil and you should resign for the benefit of society. Go on Mark - do it now. If you would not have fired Rosa Parks you are admitting that your standards are nuanced and your action in firing Caitlin is somewhat more sophisticated than Caitlin suggests in her article. So spell it out. Spell out why Caitlin's offense is a firing offense and Rosa Park's offense is not? If you don't have the intellectual nous to do that at least give Caitlin her job back. At Bronte we mostly short frauds. Our typical positions are tiny (less than 1 percent of funds under management). The reason is that if a company has fake 20 million in earnings and a market cap of $200 million there is nothing stopping it having fake $200 million in earnings and a market cap of $1.5 billion. A real company increasing its earnings from $20 million to $200 million is hard - business is tough. A fake company is just a stroke of a pen. You are thus more likely to have a really bad experience shorting frauds than real companies. The only solution we know is to short many frauds and keep the positions tiny and the aggregate position small. At one stage our biggest short (indeed the second biggest we have ever had) was First Solar. It is a much better company than we usually short - and it was the non-fraudulent nature of the accounts that allowed us to take such a large position. There was no way that the stock was doubling because there was no way the earnings were rising sharply. Alas earnings took some time to fall sharply. And we carried the short for about a year and about broke even. It was not a fun experience because we used capacity (capacity that would have much better been allocated to Chinese frauds!) and because it added to our misery during our worst couple of months ever (in the middle of 2010) as the stock raced up into the 160s. We were not short First Solar for the recent collapse in stock price. Our analysis was not bad - not entirely accurate - and the inaccuracies are painful when you look at them from 18 months distant - but all-in we were mostly right. 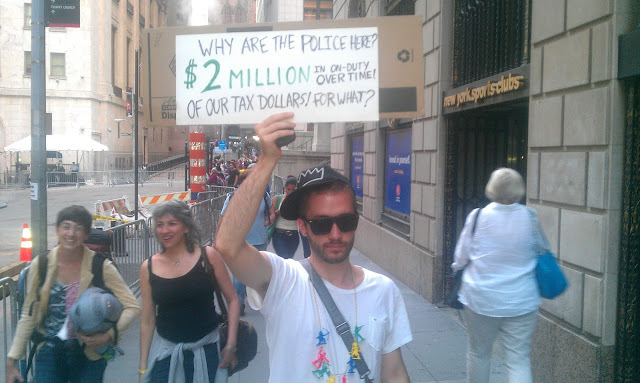 Except we made no money. With a long early is just early. With a short early is plain wrong. Technology offers value creation like few other industries. In Australia Cochlear has created enormous value and improved the world. It can literally plug a bionic ear into someone's brain-stem and get them to hear. And the stock has paid about 20X – which is better than anything in our portfolio. Many of the biggest fortunes were made in technology. But technology – and specifically technological obsolescence has thrown many a fine company to the wolves. Palm for instance is likely to go bankrupt even though the concepts it pioneered are in everyone's pocket. We do however have a framework to hang around our (limited) technology investments. A technology, to be a really great investment, must do two things. It must change part of the world in a useful way – a big part of the world is better of course – but you can be surprisingly profitable in small niches. And it must keep the competition out. In technology the competition is remorseless. In most businesses the competition might be able to do something as well as you – and it will remove your excess profit. People will build hotels for instance until everyone's returns are inadequate but not until everyone's returns are sharply negative. Even in a glutted market a hotel tends to have a reason to exist – it still provides useful service. And someday the glut will go away so the hotel will retain some value. In most businesses the game is incremental improvement. If you get slightly better you can make some money for a while. If the competition gets slightly better you will make sub-normal returns until you catch up. In technology the threat is always that someone will do something massively better than you and it will remove your very reason for existence. Andy Grove – one of the most successful technologists of all time (Intel Corporation) – titled his book “Only the paranoid survive”. He meant it. If your technology is obsolete the end game is failure – often bankruptcy. Palm will fail because Palm no longer has a reason to exist. If we wait 20 years Palm will be even more obsolete – but the hotel glut will probably have abated. Nothing left in Palm is likely to have any substantial value. Businesses that produced plenty now, produce nothing then. Surprisingly, changing the world looks like the easy bit. Plenty of companies do it. The problems are in keeping the competition out. Only a few do that (Microsoft, Google are ones that seem to). Hard drive makers changed the world (they allowed all that data storage which made things like digital photography and internet multi-media possible). But they never made large profits – and they trade at small fractions of sales. The limited technology investments we have are not driven by any real understanding of the technology. Sure we try – but if you ask us how to improve the laser etching on a solar panel then we will not be able to help. The driver of our investment theses in almost all cases is watching the competition. A simple example is Garmin. We have a small short position in what is a very fine company. Garmin – once a small avionics company - led the mass-marketing of satellite navigation and allowed John – without stress – to find his son's Saturday sports game. Sat-nav it seems has saved many marriages and meant that school sports teams do not run short players because dad got lost. Garmin has over a billion dollars cash on the balance sheet – and that cash represents past profits. It has changed the world – and thus far it has been well remunerated. Garmin has a great product. They have improved my world. The only problem is that they can't sell their product at any price that competes with “free”. Garmin's business is going the same direction as Palm. Bankruptcy however is only a remote possibility – they have a billion dollars on the balance sheet and unless they do something really stupid on the way down they will remain a profitable avionics business. Is it fair that Palm is facing bankruptcy? Or that Garmin is being displaced? We don't think so – but then capitalism is not necessarily moral or fair – but it does produce goods and services quite well. We don't invest on the basis of fair – we invest to make you good returns. 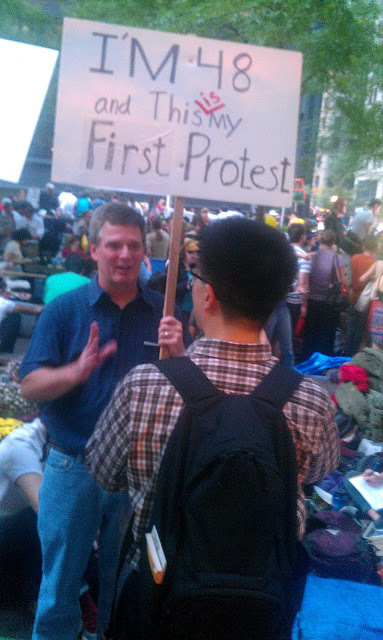 First Solar is a company that improved the world. It drove the cost of production of solar cells to quite low levels and made utility-scale solar farms viable with only modest subsidies. There are some places where solar is now viable without subsidies. Our biggest short position though is First Solar – a company we have little but admiration for. There is a distinct possibility that First Solar's business will fail in the same way as Palm or Garmin. 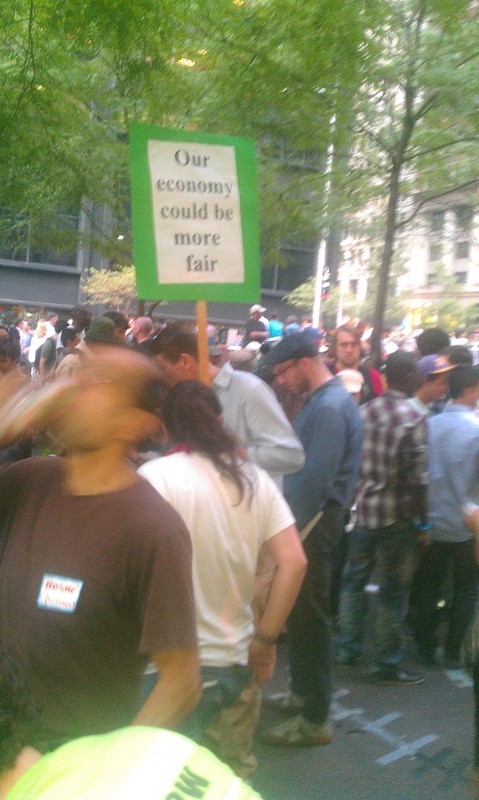 It won't be fair – but fairness has nothing to do with it. Like Garmin it probably won't go bust because it has a billion dollars in liquid assets on the balance sheet – assets which represent past profits. Moreover we suspect that First Solar's profits are about the same as the rest of the industry put together. The stock still trades with a high teens trailing price-earnings ratio – a fading growth stock. It hardly looks like a failure. It is a strange conclusion to come to. So we should explain how we got there. To do that we need to explain how a solar cell works. To make a solar cell you need three things. 1). A substance which is excited (i.e. spits off electrons) when a photon hits it. 2). A layer which separates the electrons. This layer is usually a “semiconductor” which means that electrons go through one way and cannot go back. 3). Something at the back which conducts the electrons away. Traditional solar cells were made with a semiconductor ingot cut to a thin sheet. On one side it was “doped” with a substance that kicks out electrons. The other side was laced with wires to conduct the electrons away. This was expensive. There were generally two types of ingot – monocrystalline – where the wafer structure was perfect or near perfect and polycrystalline which had visible crystals in the wafer. Monocrystalline wafers are primarily used for computer chips (where atomic level imperfections are problematic) and are expensive. Polycrystalline silicon is cheaper. For most large-scale uses polycrystalline wafers were sufficient. These have about a 17 percent conversion rate – which means that 17 percent of the photon energy that strikes them is turned into electricity. The ingot itself was a substantial part of the cost of a photovoltaic cell. Polycrystalline ingot used to sell for $450 per kg. First Solar (and others) developed a process for making solar cells with considerably less semiconductor material. They have a Cadmium Telluride process which vapor-deposits semiconductor at atomic level thickness and comes up with a cell that is now exceeding an 11 percent conversion ratio. This company is a technological wonder. Glass goes in on one end of the manufacturing process and comes out as solar cells at the other with next to no human intervention. Labour is used only when it comes to putting frames around the glass and for similar tasks. This was revolutionary – it made cheap solar panels and hence made possible commercial scale plants like this 1.4 megawatt roof installation in Germany. This is enough to supply a few hundred households – not earth shattering – but a complete revolution in the solar industry. We can think of few companies which have pushed a technology so far and with such high environmental benefits. Companies like this will allow us to maintain a modern lifestyle whilst addressing greenhouse issues. Still for all the benefits of First Solar’s cells, they are inferior in many important ways to a polycrystalline cell. Their efficiency is lower – which means you do not get as much solar energy off the constrained roof space. Secondly, whilst they save a lot on the semiconductor part of the manufacturing process they have to use more glass, more wires etc to generate the same amount of solar electricity. Each cell generates less electricity too so inverters, connectors, installation all cost more with thin film. Thin film also degrades over time. First Solar warrants their performance over their lifetime – but with the warranty being for lower levels of performance in the second decade of operation (google the Staebler-Wronski effect for a non-trivial explanation). Thin film does however have some advantages in low light - keeping a slightly greater proportion of their peak capacity. Indeed the main advantage of thin film is cost – and that cost advantage has been driven by the cost of the semiconductor component. After all ingot did cost $450 per kg. That cost advantage made First Solar absurdly profitable – and they used that profit to grow into a behemoth. Revenue has grown from $48 million to over $2 billion. Gross profit (before selling and administrative costs) has grown to over $1 billion. We do not want to tell you how far the stock ran for fear of invoking insane jealousy. This stock would have made Berkshire Hathaway shareholders jealous. But remember – all of that was predicated on a cost advantage (almost all other things being inferior). And that cost advantage is predicated on expensive semiconductor material. To make money in technology you need to do two things. Firstly you need to change the world (which First Solar clearly did) and secondly you need to keep the competition out. Alas very few businesses manage the second trick. The competition came in a couple of forms. Firstly it came from Applied Materials. Applied Materials, or AMAT (as the company is known) is the most important company in the world you have never heard of. It is the dominant maker of capital equipment that goes into semiconductor factories and it is thus the company that – more than any other – provides the kit to keep Moore’s Law active. AMAT has tried competing head-on with First Solar in the thin-film space. AMAT developed the vapor deposition equipment that made large-screen LCD televisions possible. This entails deposition in large sheets (5.6 square meters) which are then cut down into several large screen TVs. An imperfection in the vapor deposition shows on the TV as a bad pixel. Far more important have been developments in the wafer business. AMAT (often the protagonist) has developed wire saws for cutting wafers thinner and thinner. They are now 80 microns thick. These wafers are so thin that they flutter down in air and break if held on their side. AMAT will of course sell the whole kit for handling these wafers – including laser etching material and other steps in the manufacturing process. Much less semiconductor is needed in the wafer business. But worse – the price of ingot has fallen – and spot prices are now $55 per kg – which is a lot less than $450. The cost of ingot is still falling. First Solar’s advantage is entirely dependent on the fact that they use much less semiconductor than wafers – an advantage that disappears entirely as wafer prices fall. At that point all of First Solar’s many disadvantages will shine through. We are trying to work out the cost-structures of the polycrystalline manufacturers – but it looks to us that the extra glass and other balance of system costs that First Solar panels have are getting close now to completely removing the advantage of low semiconductor material usage. If that happens though, First Solar is toast. It probably won’t file bankruptcy because it has so much in past profits to fall back on – but it will be every bit as obsolete as a Palm organizer is now or a Garmin car navigation system might be in five years. We do not wish failure on First Solar – and if we are right it could not have happened to a nicer company (no irony intended). Capitalism is not fair – and technology investment is particularly unfair. We don’t make money from fairness. We make money from getting the business analysis right and betting on (or against) the right business – and in this case we are betting against the most successful company in a massively important growth industry. If we are right (and we think we are) then we will make money from the demise of a company that has much improved the world. We like to think our business is noble. And it is sometimes – but in this case we can see why people dislike short-sellers. Their opinion however is not our business. Unfortunately the hotel is usually mortgaged – and the value often reverts to the debt holder. One of the biggest benefits I get from writing this blog is that sometimes some very smart people disagree with me. In the investing business you will be wrong often. The earlier you realize that you are wrong the smaller (on average) your losses will be. I don’t think the blog can move markets through talking my book. (I disclosed a good argument for shorting First Solar and the stock went up!) But I do think that kick-back from smart people can help reduce my losses when I am wrong. Believe me that is often enough! If all that the blog delivers me is smart people who disagree with me then I will wind up being a well-paid blogger (and my clients will be grateful)! I got a lot of kick-back on my First Solar piece – some of which makes me more nervous about the short – and some of the kick-back is from people who are very smart. I thought I ought to lay this kick-back out at least in part to get my own thoughts straight. One of the solar industry trade publications asked my permission to republish the piece – which I have granted. They also warned that they might have a follow-up piece titled: “Why I am short Bronte Capital”. That ought to put us in our place! I have yet to see that piece – but honestly I look forward to it (even though reading it will be painful). It may convince me that I am wrong – in which case I will cover my short forthwith! The core to my argument was that First Solar has disadvantages (notably lower conversion efficiency) offset by a couple of advantages – notably keeping higher generation in low light, less sensitivity to angle of light – and most importantly – lower cost. My view was that lower cost would determine almost everything. Solar modules are fundamentally a commodity – and whilst the low-light advantages were real – they could easily be overwhelmed by cost. I then made an assertion – which I did not back – that the cost structure of wafer-based cells will be competitive against CdTe (First Solar) cells when the polysilicon price gets low enough. Most – but not all – of the kick-back I have received is based around this cost structure issue. This falls into two camps. Firstly they assert that I have the cost structures of the competitors wrong. Secondly they asset that First Solar will reduce costs enough to offset the advantage that wafer-module-manufacturers get from lower silicon prices. The other kick-back I have received is on the sales-and-marketing department. First Solar has – according to customers – by far the best sales force. “They are a machine!” First Solar they think that this will allow First Solar to travel well for longer than I might anticipate. Moreover they thought First Solar’s average selling price would remain high because FSLR has presold a lot of modules to solvent utility scale operators – notably EDF in France. In this post I examine these issues with the aim of getting my own thoughts straight (and hopefully invoking more kick-back from more people that are smarter than me). Polysilicon has several disadvantages vis CdTe technology. First the materials are more expensive (wafers are thicker than thin film) – but just as importantly the manufacturing process is much more complicated. At First Solar glass goes into the plant and comes out – about three hours later – as an almost complete module. Human involvement is minimal. Wafers however require more manufacturing – they are sawn – they have breakage rates – they are laced with wires to conduct the electricity away – and they are “assembled”. Manufacturing cost are higher. In the fourth quarter, our non-polysilicon costs including depreciation further decreased to $0.76 per watt from $0.81 per watt in the third quarter and $0.86 per watt in the second quarter and $0.90 per watt in the first quarter of 2009. This decrease demonstrates our strong R&D capabilities, and execution capabilities to continuously improve the yield rate, field conversion efficiency rate and operational efficiency. The blended cost of polysilicon continuously decreased by the mid-teens in the fourth quarter. I would like to emphasize again that Yingli has now provided long-term (inaudible) provisions to write-down inventory costs or polysilicon prepayments the challenging fourth quarter of 2008. Solar wafers used to require 7 grams of silicon per watt. Some manufacturers run at about 6.2 grams of silicon per watt – with 180 micron silicon. Applied Materials talk about 80 micron thick silicon wafers – though silicon use for those wafers is not reduced by 80/140 because wire saw (kern) losses are similar regardless of wafer thickness. Also as wafers get thinner they have higher breakage rates (and the incentive to cut wafers thinner is lower as silicon prices fall). YingLi cost per watt (in cents) = 76 (less any efficiency they get from manufacturing improvements) plus silicon price (in cents per kg) * 0.0065. Now I am going to take a wild stab at what the number will be by June 30. My guess is that spot silicon will be $40 per kg and the 76c will be reduced to say 71 cents (which is still falling but by less than the 4c per quarter which the cost has fallen). This gives a cost per watt by the middle of this year of 97 cents. Polysilicon costs go below the magic dollar per watt! Obviously this is highly dependent on the silicon price – a $20 silicon price would make the cost 13c per watt cheaper – say 84 cents per watt. A $100 silicon price takes cost per watt to $1.41. Cost is also dependent on YingLi (and presumably the other commodity panel makers) getting efficiencies in the production of modules although at a reasonable clip – though as noted, I model a rate below the historic rate of cost improvement. This cost model is fraught. The accounting of many of the Chinese players is difficult to decipher. One person I have talked to suggests that most other players are way above 78c per watt in non-silicon costs (although competition will get them there or force them out of business replaced by people who are at that level). They thought YingLi would be at 70c by the end of 2010. Against this the same person thought my grams per watt was too high (suggesting 6 grams per watt based on 180 micron thick wafers) and they thought that YingLi would be at 5.5 grams per watt by the end of the year. This is more or less a wash – with wafer costs a little lower than my estimate but base costs winding up a bit higher. Again all of this stuff is fraught – and although these broad numbers are not controversial the end competitiveness of First Solar is surprisingly sensitive to fine differences in base cost and silicon costs of their competitors. What is the cost structure of First Solar? First Solar has laid out ambitious plans to increase the efficiency of their cells and to further reduce costs. I do not want to go through those in detail – but I think we can extract two key charts from the last presentation. First slide 13 – which has the cost per watt falling still – but at decreasing rates. The cost-per-watt has fallen by 1-2 cents per quarter for the last couple of quarters (versus 3-5 cents for the non-silicon costs at YingLi). Then there is the less-specific presentation from their “roadmap” (see slide 14) which shows their 2014 target cost per watt. I wish I understood how all of these gains were likely to be achieved – but they think they can get to 52-63 cents per watt by the end of 2014. However – for the moment I assume that they can meet their cost target and get to 58c per watt (a reasonable midpoint) by the end of 2014. That cost per watt reduction is 26c over 16 quarters – or 1.625 cents per quarter – roughly the rate at which costs have been falling historically. Figuring that the were at 84c per watt during the fourth quarter of 2009 – and they are reducing costs by 2c per watt per quarter (that is a little faster than historic and slightly faster than their roadmap) costs will be about 80c per watt per quarter by the June quarter of this year. On this cost structure the YingLi panels have higher production costs unless the silicon price is very low. That sort of makes sense. YingLi panels have higher production costs (the process for making them is more complicated) offset by lower non-silicon materials costs (they are more efficient and hence use less glass, backing wire etc). The swing factor is silicon. This table however leaves off the single most important swing factor – which is that the YingLi panels are smaller per watt of output. (Remember my whole argument is dependent on the higher conversion efficiency of the polysilicon wafer modules.) There are wildly different versions of how much the installation cost advantage is. The advantage comes about because you need less cells, less land, less brackets and less converters to generate the same amount of energy. This paper from the National Renewable Energy Laboratory has been my guide. This paper suggests that First Solar modules need to be priced 25-30 cents below c-Si modules to generate equivalent project returns (see page 26). Some people think this far too high. For instance Stephen Simko (an analyst from Morningstar who disagrees with me) thinks a 10 percent penalty (roughly 7c per watt) will do the trick. I for the life of me do not understand why this is a percentage (there is limited evidence that installation costs are falling at the same rate as manufacturing costs). 7 cents per watt is very different from 25-30 cents. I would really like people to detail what the cost difference is. (If informed people send me emails I will be grateful…) I suspect it depends on all sorts of things like labor costs, brackets, land availability and things you would not expect like wind levels (wind requiring better anchoring for the panels). Now at this point the First Solar cells are about cost-competitive at a $40 silicon price. If silicon prices go as low as $20 per kg then the Chinese polysilicon makers (represented by YingLi) have the goods by a long margin. I should note that this cost structure does not match the cost structure as presented by several people bullish First Solar… Here is a cost structure as presented by Stephen Simko comparing First Solar to Trina Solar (yet another Chinese wafer-module maker). In it however he keeps the silicon price constant at $45. You can see the difference between Simko’s estimates and mine. I have Q2’10 costs for the wafer manufacturer a few pennies (say 3c) lower than Simko. Simko has the cost structure of First Solar falling about 3c per quarter (versus my 1.5 cents per quarter and adding up to a further 3c cost advantage) and he has an efficiency penalty of about 8c versus my 15c (or another 7c of cost advantage). He thus has First Solar maintaining a cost advantage of about 15-18c per watt over the next twelve months whereas the extra costs I suggest wipe most of that advantage. What drives the polysilicon price? As the solar industry ramped up polysilicon prices disconnected from their cost curves. Spot prices of $450 were not unknown. The NREL paper cited above mentions spot prices higher than that. The spot price however was rarely paid – because most wafer makers purchased large inventories and entered into forward contracts. Some solar-cell makers have got themselves knotted up financially because they have purchased thousands of tons of polysilicon inventory at prices that are well above current prices and which prohibit them from making profits. The excessive profits made by the ingot makers introduced many new suppliers to the industry. One source suggested that we have gone from six suppliers (and a cozy oligopoly) to 26 suppliers (who will cut each other’s throats). This market is becoming very glutted very fast. That means that the poly price will go to marginal cash cost. So what is that cost? Well I started with the big players – and they have cash costs in the low 20s. I thought the polysilicon price would thus go to the low 20s. That would settle the issue because – even on the Stephen Simko’s numbers – the Chinese-wafer-based modules will have lower costs than First Solar at a $20 polysilicon price. So – without stating it so clearly – I thought that the poly price would wind up closer to $20 per kg than the $45-55 modeled by most First Solar bulls. If this curve is correct the polysilicon price is unlikely to get to $20 because the marginal players will have costs substantially higher than $20. This REC graph however has given me pause – because the really brutal outcomes for First Solar were dependent on a very low silicon price. If the silicon price were really to go to $20 and my cost numbers (somewhat more brutal than Simko and other bulls) are right then First Solar will wind up with no reason to exist – and the stock will go below $10 (currently about $130). If the poly price does not go below $45 and Simko’s numbers are right then First Solar will keep a cost advantage – and that cost advantage is sustainable – at least until a better technology comes along or First Solar’s patents run out. First Solar earnings might be difficult – but the business has a reason to exist. Looking at the current price for modules is not going to help you much. Many companies have both purchased silicon at fixed rates and pre-sold panels at fixed rates. First Solar locked in lots of fixed rate contracts – some with good solvent parties (for example EDF) – some with parties that are more questionable. The current prices realized by the solar manufacturers depend more on the contracts that they entered into (both price and solvency of the counterparty) and less on spot price for panels than a first glance might look. There are disclosures in First Solar’s 10K which illustrate the problem. These disclosures can be read as “red flags” though I prefer to keep more neutral about their content. During the first quarter of 2009, we amended our Long-Term Supply Contracts with certain customers to further reduce the sales price per watt under these contracts in 2009 and 2010 in exchange for increases in the volume of solar modules to be delivered under the contracts. We also extended the payment terms for certain customers under these contracts from net 10 days to net 45 days to increase liquidity in our sales channel and to reflect longer module shipment times from our manufacturing plants in Malaysia. During the third quarter of 2009, we amended our Long-Term Supply Contracts with certain of our customers to implement a program which extends a price rebate to certain of these customers for solar modules purchased from us and installed in Germany. The intent of this program is to enable our customers to successfully compete in our core segments in Germany. The rebate program applies a specified rebate rate to solar modules sold for solar power projects in Germany at the beginning of each quarter for the upcoming quarter. The rebate program is subject to periodic review and we adjust the rebate rate quarterly upward or downward as appropriate. The rebate period commenced during the third quarter of 2009 and terminates at the end of the fourth quarter of 2010. Customers need to meet certain requirements in order to be eligible for and benefit from this program. Essentially the customers or sales channel was liquidity constrained – so terms needed to be made more generous (45 days versus 10 days). Moreover we needed to offer a price rebate (presumably a rebate on our fixed price contract) to enable customers to compete. Those rebates were subject to certain tests (presumably solvency tests but we do not know the content of those tests). Some of these contract changes exchanged smaller fixed price contracts for higher volumes at lower fixed prices. Whatever – the industry is rife with fixed price contracts. Spot prices are below the fixed price contracts. One day these fixed price contracts will roll off – and new fixed price contracts will struck at considerably lower prices. As we do not know the duration of the fixed price contracts – and even if we did that duration keeps getting extended in exchange for lower prices – we can’t really tell the path of the selling price. But I have a method which should be familiar to any economist – and I think works for working out where the long term selling price will wind up. It is simple really. The Chinese competitors are numerous and very hard to pick apart from each other. Some are ultimately going to be pennies per watt better than others – but because they are numerous and in fierce competition they will drive the price. This should be bleatingly obvious – anyone who has competed with numerous Chinese manufacturers by now would know that the price is driven down to the price where the Chinese manufacturers make a mid single-digit ROE. That price however is much lower than the current selling price and probably much lower than the selling price First Solar will realize in 2010. Moreover the price should be fairly easy to determine: I will just do it for one manufacturer. At year end Trina Solar had book value of $677 million. Some of that value was inflated because they were carrying some high-cost silicon inventory. They had output ability of about 550 megawatts per year (averaging 600 in panels and 500 in wafers). To earn 15 percent pre tax on that equity they need to make roughly 100 million per annum or they need a margin of 18c per watt sold. The first-cut estimate of the long term price of these things is thus – and I am being very simplistic here – whatever the Chinese manufacturers cost plus 18c per watt. This first cut however is a sharp over-estimate. The equity I am including is too high because of overpriced inventory. The ROE I am demanding is too high too (Chinese competitive manufacturers make far less than that!) The industry is continuing to get efficiencies – and they will be competed away – so the margin per watt will come down for that reason too. You do not need to make any unreasonable assumptions for the right margin per watt over the cost for the Chinese manufacturers to be 10c. From here an earnings model is easy… First Solar will produce (on their guidance) about 1.7 gigawatts this year and 2 gigawatts next year. The selling price will be whatever YingLi’s cost is plus 10c… You can work out the margins using either mine or a bull’s cost estimates (I use mine). Multiply margin by wattage and you get pre-tax profit – give or take a little bit. I do this below. Now – using numbers I think are inherently likely – I get earnings falling sharply. If we take the silicon price to $20 then First Solar has no earnings. If we think the installation penalty is 25c rather than 15c as per the NREL paper earnings go away up to a silicon price of about $40. So far my argument has been predicated on the silicon price falling. At low silicon prices First Solar becomes uncompetitive. The only real question being how low is low? But First Solar can become more or less competitive depending on how much they can reduce costs or increase efficiency versus their Chinese wafer-based competitors. First Solar has an ambitious target of reducing costs over the next four years. I want to repeat the slide on that cost reduction strategy. Now I know you have seen this slide before… what you probably did not notice is that it is not drawn to scale. The company plans to get 18-25 percent cost-per-watt reduction via efficiency – and and only 15 or so percent cost-per-watt reduction through everything else (plant utilization, scale etc). That makes sense because First Solar plants are already highly automated. Glass goes in one end and almost-complete modules come out the other end with little human intervention. It is almost impossible to improve that manufacturing because it is already almost perfect! So the only place they can get their cost-per-watt down is by getting more watts-per-glass-sheet – that is improving efficiency. Efficiency is the core to First Solar’s roadmap to lower costs. I will be blunt. I do not think they can do it. Efficiency is already 11.1 percent. If they get 21 percent out of efficiency – something like a midpoint of their 18-25 – then they need to get efficiency to 13.4 percent – and they need to do it over 16 quarters. Efficiency must improve almost 15 bps per quarter. Efficiency for the last six quarters was 10.7, 10.8, 10.9, 10.9, 11.0, 11.1 percent – something less than 10bps improvement per quarter. This is something which should asymptotically approach a theoretical limit – and yet First Solar is modeling that the rate at which they improve efficiency will increase for the next four years. Maybe they can do it – but trees do not grow to the sky. Against this – what is driving the Chinese manufacturers is manufacturing efficiency as well as conversion efficiency. The Chinese processes are difficult – involving sawing, lacing wires on wafers and assembly. There are many more and difficult steps than First Solar’s thin film process. That is bad for them now but provides opportunity. Chinese manufacturers are – if we know anything about them – relentless in taking out costs. So my guess is cost-per-watt will fall faster in the Chinese silicon manufacturers than in First Solar precisely because there are more opportunities for manufacturing improvement. So there you have it – the whole First Solar thing modeled out. I think I am right – but sensible people take the opposite view – and one industry publication wants to write a piece about why they are short Bronte Capital. If anyone tells you this investing game is easy ignore them. This is tough – and the bets we take occasionally fill us with angst. The widely distributed - nay viral - picture of a young woman carrying a sign referring to Abacus - the much litigated Goldman Sachs/Paulson/IKB deal got me thinking. 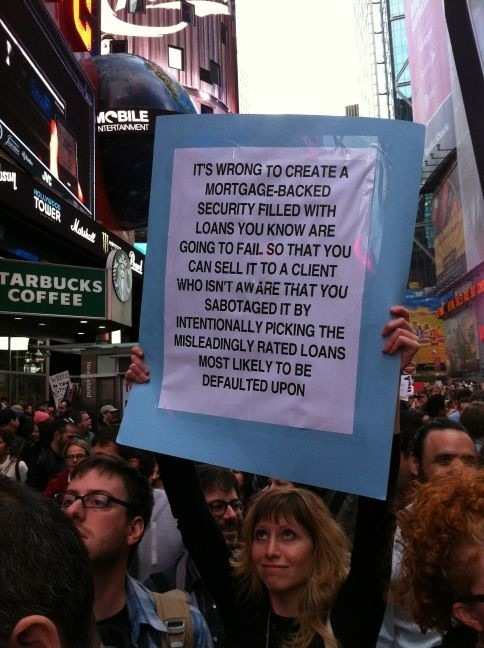 It says that "It's wrong to create a mortgage-backed security filled with loans that you know are going to fail so that you can sell it to a client who isn't aware that you sabotaged it by intentionally picking the misleadingly rated loans most likely to be defaulted on". I can't help but agree except this is not what happened in the Abacus case. The Abacus security was an entirely synthetic security. It was not filled with loans that were intentionally picked, it was loaded with derivatives that someone thought were most likely to be defaulted on. That is an important distinction. If Goldman had created a security filled with bad loans and sold them there is no way that the client would be able to work out that someone was betting against the loans. I think Goldman Sachs was done here unfairly (although it is hard to imagine it happening to more deserving people). Anyone who was financially sophisticated (and IKB certainly portrayed themselves as sophisticated) should have realized there was an opposite side to that bet and that someone had deliberately taken the opposite side with respect to every derivative in the bundle. Now contrast this with what happens when I make a short sale. I borrow a security from a broker which is identical to any other security with the same cusip number. I sell it in the market. The person on the other side purchased a security and they have no idea whether they purchased it from a long or a short. People who buy securities from me in the regular securities market are at a disadvantage to IKB. IKB knew there was someone making the opposite bet. When we make money short selling (and we have made plenty) the people who lose have no way of knowing that Bronte/John Hempton was on the other side of the bet. I am (in part) a short-seller. I regularly try to stuff the market with securities that are "intentionally picked" as "most likely to be defaulted on". Huabao - a fragrances and flavors company and the subject of attention on this blog - has suffered a rapid stock-price decline lately. The company put out a press release related to the unusual activity in the stock. We have noted the recent decreases in the price of the shares and the significant trading volume involved of Huabao International Holdings Limited (the “Company”). Save as disclosed below, we are not aware of any reasons for such incidence. I have a simple question: what is the "derivative transaction" that Ms. CHU Lam Yiu entered into regarding over 94 million of her shares? (d) some combination of the above. All of those are bets against her shares in some form or other. Of course I can be mistaken, but it seems the CEO is betting against her own shares using derivatives. I am also betting against her shares - so I have something in common with her. You see I am just a guy who reads public filings. She is the controller of the company and the world's youngest self-made female billionaire. She is a smart cookie too: took her company public via reverse takeover, sold a chunk of shares in 2008, and again in 2009 and again recently. She is, on some lists, the eighth richest woman in the world. And she still seems to be betting against her shares. Mostly she sells at lower prices. But whatever: I think we are entitled to know precisely the nature of the bet that the CEO has taken against her shares. I am happy to disclose my bet: I am short. Ms. CHU Lam Yiu, it is your turn to disclose. The Shanghai Daily (subscription required) has taken to calling Zhu Linyao as the "Queen of Cashout". She is otherwise known as the controller of Huabao - an interesting company I have previously written about. She is the second biggest insider-seller of any Chinese stock according to this list - having cashed out about half a billion US dollars this year. I have now emailed with many people who have an interest in Huabao. Some visited the (recently purchased) reconstituted tobacco leaf plants - and they were moderately impressed. Some visited the flavors plant (the legacy business) and they found a few blue drums and a vat full of strange liquid but nothing redolent of a business then worth over USD3 billion. They ran a mile from the stock. The most impressive website any of the people I communicate with has found is for their Peacock brand. They sell 572 products (far less than most retail shops) including "tomato sauce" and "cheese powder". Press "new products" and you get a one word answer: "no". A similar response is given for "food flavor". Isn't this meant to be a flavors company? This compares as I noted in my previous blog post with maybe 100 thousand pages of text on the website of the major company in this industry (Givaudan). It is unlikely you make 60 plus percent margins reselling flavored yogurt on an obscure Chinese website. I am not joking - see this link. The only way that the margins - almost five fold the margins of Western competitors - are possible is by selling at an inflated price to the Chinese state owned tobacco companies. And indeed that is what the bull story is as many of my readers have pointed out. I can neither confirm nor deny the existence of those sales. My only correspondents who have visited the factories responsible for those sales found a few blue drums. But there might be a large and complex factory behind that or there may be other sites so their word should not be taken as complete. Maybe that is why Zhu Linyao is the "Queen of Cashout". We now have a commercial arrangement with Diageo - albeit a temporary (though tasty) one. But that has not stopped us writing a press-release trumpeting this "strategic partnership". I may send a copy to the news wires to see if they will run it. Trina Solar Limited (TSL) ("Trina Solar" or the "Company"), a leading integrated manufacturer of solar photovoltaic (PV) products from ingots to modules, today announced that through its subsidiary, Trina Solar Australia Pty Ltd, it has signed a strategic partnership with Origin Energy Australia ("Origin"), the leading Australian integrated energy company. Under the terms of the agreement, Trina Solar is expected to supply Origin with approximately 22 MW of PV modules over the next twelve months starting from the third quarter of 2011. "We are delighted to initiate our relationship with Origin, Australia's leading energy retailer and the country's largest green energy retailer with significant investments in renewable energy technologies," said John Susa, Trina Solar's Country Manager of Australia and New Zealand. "We are confident that this long-term partnership with Origin will bolster our ability to expand and strengthen our market position in the residential segment." Being a cynical sort of guy - and knowing that Origin Energy are reputable I checked this release. Here is what Origin said. I blogged this response here. I almost did not need to check. When a party announces a "strategic partnership" and the press release offers contacts from only one side of the deal then you should be skeptical. Indeed it can hardly be strategic if only one side comments. There are other strategic partnerships announced by Trina. In all cases there is no contact given for the "strategic partner", for they once announced a strategic partnership in Italy. I have been waiting for Italy since I got here. So, we are actually seeing some good activity finally. And we have some pickup in activity. We see it. Obviously, our historic Italian account is at the utilities. We also see Spanish accounts that a lot of them actually served projects there. So, after much waiting and unclarity, we are seeing some pickup in demand. There is – we still have a mix of utility projects in commercial rooftop there. And so what we are seeing moved quicker was the stuff that was utility that was finishing off and now it’s blending into commercial rooftop. It is possible that Italy was taking off just as he said this - but it seemed unlikely to us. After all the banks in Southern Europe were under sharply increasing financial stress at precisely the time of this conference call and funding for long term projects (like solar) was drying up. I did not believe the statement. Maybe it was true - but there is a problem with statements about insignificant "strategic partnerships". Those statements predispose you to not believe further statements. So here is what I believe. I believe Trina is burning cash increasingly fast. So fast that it is in deep trouble. Trina, through operating cash burn and capital expenditure chewed through $136 million last quarter. I blogged the calculation here. 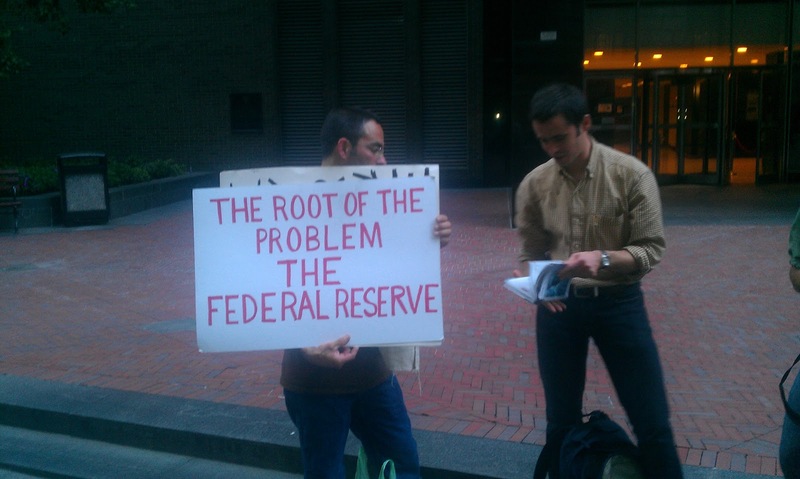 Chinese banks funded this. The average selling price during the quarter was $1.46 per watt (reference given here). The prices per watt have fallen to $1.10 or below when priced wholesale. So revenue per watt is running 36c lower than during the quarter. The costs per watt have dropped too. Polysilicon has dropped from say $48 to $38 per kilogram - but exact numbers are hard to find. At 6 grams per watt the costs per watt thus dropped 6c. Efficiency gains add another 2c reduction in costs per watt. Nonetheless margin per watt will be 28c per watt lower than last quarter. Production is going to be (at least) 450 million watts - so aggregate margin is going to be $112 million lower than last quarter. There won't be any tax paid - or anything like that - but the company looks like it will burn through $136 million plus $112 million in cash - more if stuff keeps accumulating in warehouses - less if the hard-selling they are doing actually works. $248 million per quarter - or roughly a billion dollars a year is a little bit much for Trina to bear. Unless there is something dramatically wrong with my calculation Trina is doomed. Not even a Chinese bank comes at a billion a year funding requirement just to stay in business. Now of course all of this is my estimates. I can only go on public information and my own inquiry and my own analysis. I wish I could just use Trina's statements but - and it might just be the PR people who have done this - Trina has devalued its statements with overblown puff pieces about "strategic partnerships". But I have trouble trusting Trina. And you should have trouble trusting me. I am effectively short the stock. Besides, I have just entered into a very enjoyable "strategic partnership" with Diageo. And I might just have another Guinness. Jeff Matthews (he of the fabulous blog and excellent book on Warren Buffett) tweets every day his least helpful broker call. His twitter stream is here. JeffreyMatthews Jeffrey Matthews Least Helpful Call, So Far: JPM cuts price target for TRMB (gps for construction) from $51.50 to...wait for it...$47.50. Last trade, $37.49. Jeff however does not follow Hong Kong listed frauds. Ji Asia is terminating coverage of Chaoda Modern Agriculture (Holdings) (682 HK, HK$1.10, Ji BUY, Target HK$10.50). The price on my screen is 55c but it is not trading any more. The reason stated by Felix Fok is "following a realignment of resources within the team". Chaoda is suspended for a reason: it is almost certainly a grotesque fraud. The buy was a bad call. The dropping coverage: that was clearly the most useless call of the day. Disclosure: Proudly short Chaoda Modern Agriculture. This evening I was in a restaurant in Little Italy New York. Fine place too. The maître d’ asks loudly if there is a doctor in the restaurant. Nobody responds. He asks again. Nobody responds. I have a surf-lifesaving first aid certificate and volunteer at Bronte Beach. (I have previously blogged about that.) In the absence of anyone else I volunteer. The victim has fallen over (his wife later tells me he was drunk) and he has hit his head - but for all I can tell he had a seizure. Whatever: he was barely conscious and was not answering his name or details. Still he has landed in a recovery type position or moved to a recovery type position. His mouth is pointing down. I checked that he was breathing - and he was - his chest was moving up and down. I asked him a few questions and I got no answer but he said he hated this and then said nothing sensible again. I did not get a name. I did not see any upside in moving or treating him so I just chatted to him (without response), monitored his breathing and waited for the ambulance. I am an Australian who loves America. Many things are better than Australia. Many things however are worse. Litigation risk that means a nurse would rather sit there watching an unconscious person bleeding rather than help them - that is something that is worse about America. A couple of years ago my wife and my business partner's wife turned up at our office in Bondi Junction and then went shopping in the mega-mall below. This is the sort of thing that gives a tight-wad like me nightmares. A couple of hours later they returned with their bags. My wife was wearing a new perfume which I kind of liked. I would have told her I liked it even if I was completely indifferent (she is my beloved wife) but I could say it honestly. 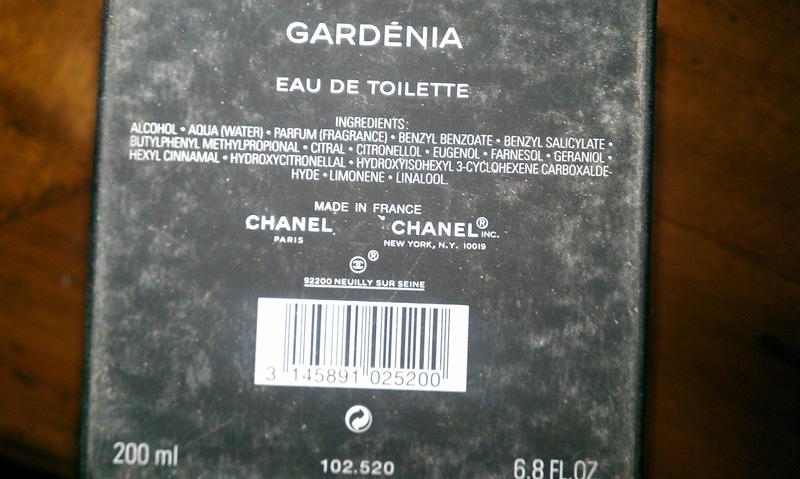 It was Chanel Gardenia. This was about a month before our tenth wedding anniversary so I had solved the gift problem – or so I thought. Later I popped down to DJs (think Nordstrom for Australia) and Myer (the also-ran department store) looking for Gardenia. No chance. Eventually a customer took pity on me and told me you could only find this at the Chanel shop. I could see the bill going up. I found the Chanel shop in a part of the mall I never visit and the shopkeeper (an elegant woman in high-heels who looked straight through me) eventually showed me the perfume which came only in sizable and expensive bottles. Three minutes later and $230 lighter I had my gift. It is a pretentious label. They call water “Aqua”. Guess they can't bring themselves to admit they sell water at almost $1000 per litre. Alcohol is the main ingredient – probably a good proportion of the total. Most the rest I had never heard of. Being an inquisitive type I looked them up – I even looked on Alibaba for the cost (per tonne) of these chemicals so I could get some idea of how much I was being ripped off by the fancy box and the elegant lady in high-heels. It spoiled the romance but was educational. According to Wikipedia, Citral is a 3,7-dimethyl-2,6-octadienal or lemonal, is either of, or a mixture of, a pair of terpenoids. The E-isomer is known as geraniol (also an ingredient of the perfume). It is pheremonal in insects (and in the hope – probably vain - of the perfume manufacturer pheremonal in humans too). There are lots of suppliers on Alibaba – mostly by the barrel. Most of these are distributors for Givaudan – a Swiss flavors and fragrances business. Linalool is a major fragrance chemical used – according to Wikipedia – in 60-80 percent of “perfumed hygene products” and also by pest-professionals as an insecticide. (Note what this perfume does – drives insects wild with pheremones and kills them. Think what it can do for you!) Again most the distributors on Alibaba are distributors for Givaudan. You can buy it here for $5 a kilogram and they will sell you 1000 tonnes per month. It is kosher (and Halal) too! From there I went looking at Givaudan – the company that probably manufactured this fragrant “Aqua”. It is an interesting company with an enormous website containing technical specifications (instructions, FDA approvals etc) for the thousands of flavors and fragrances it manufactures. When you see apple-pie and cheesecake flavored yogurt what you are seeing is their fine Swiss technology. There are - if you do a Google count - about 11 thousand pages on this website. This is a sophisticated and wide-reaching business. Givaudan is an interesting stock (we think about it as a long) and it is currently trading fairly low relative to sales vis its history. It is the technological leader in flavors and fragrances. This company does CHF336 million (almost 400 million dollars) a year in research and development. That is what your cheesecake flavored yogurt and Britany perfume cost to develop. This R&D is a pretty solid barrier to entry. 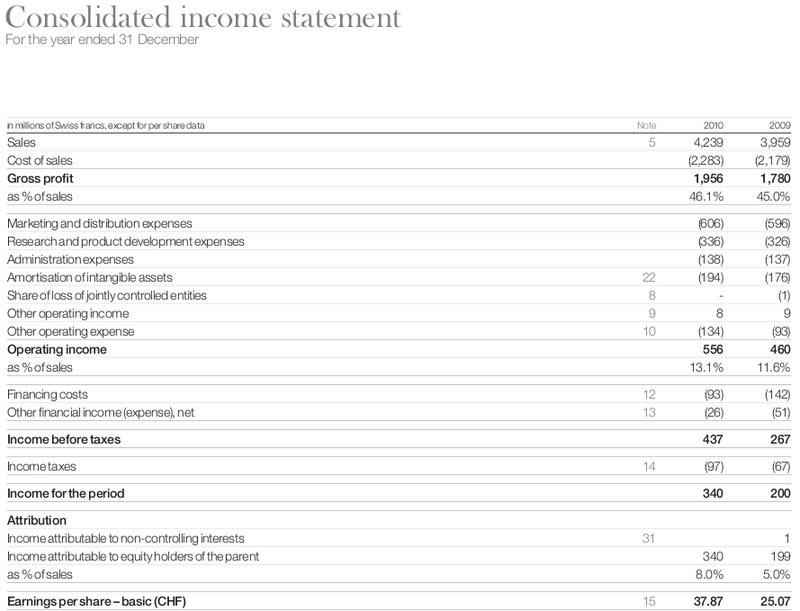 After quite considerable distribution costs (you have to interest the food manufacturer in the bizarre terpanoid you have developed) and considerable R&D Givaudan winds up with operating income of 13.1 percent of sales. There is another flavors and fragrances company – International Flavors and Fragrances – that used to be the leader and is still the leader in tobacco flavoring (a declining business I would guess). IFF is well known to people who have read the investment classic “Common Stocks and Uncommon Profits”. IFF had a tech leadership for generations and was a fantastic stock - it is still not a bad one. Somehow (I don't know how as I do not have the history) it ceded much of that leadership to Givaudan. All very interesting and grist for the memory bank. Recently I came by Huabao – a Chinese flavors and fragrances company listed on the Hong Kong stock exchange. Market cap is about 20 billion Hong Kong dollars - about 2.5 billion USD. The web site clearly is not as sophisticated as Givaudan. Counted pages on the site in Google total 49. Huabao has a market cap of a bit over a third of Givaudan, and is a strange beast. Like IFF it claims to be primarily a tobacco flavorant. Here is the P&L. Huabao it seems is a truly miraculous business. 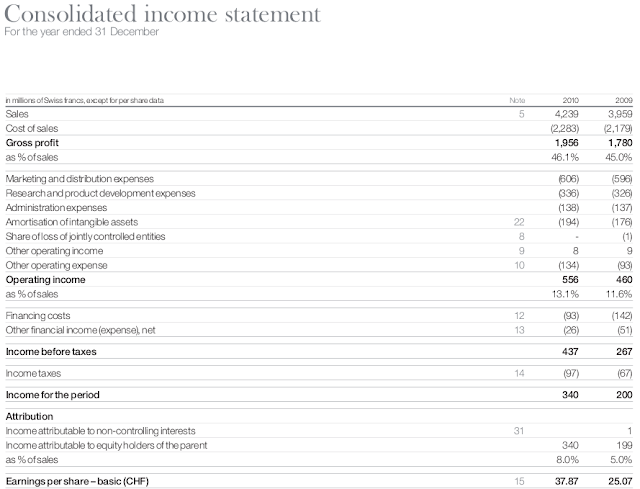 Gross profit is over 70 percent. Marketing and distribution expense is 80 million Hong Kong dollars – roughly a twentieth of Givaudan. Research and development expenses are 73 million HKD – a little over 10 million or about a fortieth of Givaudan's expense. Profit before tax is 1871 million Hong Kong dollars on total sales of 2852 million HK dollars. That is 65 percent of sales and it compares (very) favorably with 13 percent at Givaudan of sales. Huabao gets superior margins – nay vastly superior margins – whilst doing much less R&D and having much less selling expense. Truly miraculous. 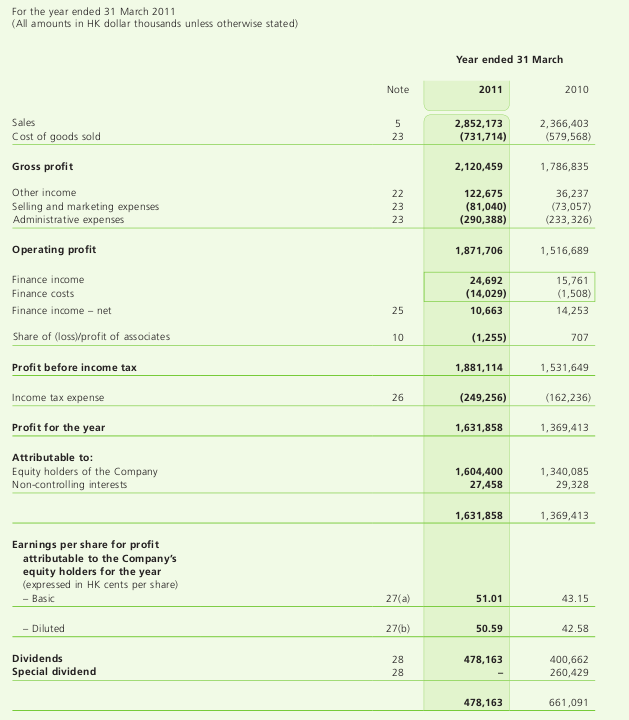 Givaudan – the putative technical leader – should watch out. I wanted to work out what Huabao actually sold – what R&D they had – what technology they had that justified their superior returns. Alas this was difficult. You see HBGlobal.com is not a very informative website. Here – in pictures – is the page (yes one page) that describes their product set. I went looking for all the chemicals in my wife's perfume on Alibaba. I could not find Huabao as a supplier. Nor could I find HBGlobal. I googled “+Huabao. +citral” and the core reference I found was to Jishui Huabao Natural Medicated Oil Factory being a buyer of citral. Similar results were obtained for other chemicals. I did this with lots of combinations of chemicals and the brand names they operated under (at least the brand names they operated under according to the HBGlobal website). 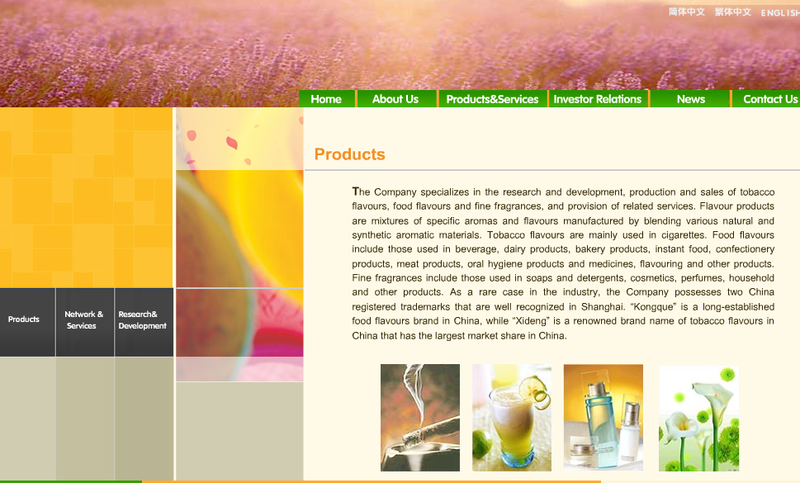 The website states that Kongque is a long established food additives brand in China. Kongque turns up in one index as one of literally 40 pages of suppliers for food flavor additives. Here is their entry which tells you nothing about them but gives a limited range of products (Lecithin, Foodstuff Essence, Flavor, Collagen Protein, Stuff Additives, Trichloromethyl Sucrose, Crystalline Fruit Sugar, Phosphate, Water-retaining). I have no idea what "stuff additives" are - and Trichloromethyl Sucrose is also a strange product - according to some links a sweetener 8000 times as sweet as sugar - but I can't find any non-Chinese references to it. Moreover this claim is likely false: saccharine is usually thought to 300-500 times as sweet as sugar and that is sweeter than most of the other standard sugar substitutes. This tiny list of lightly specified products does not compare favorably to the sophisticated list at Givaudan. For the life of me I can't work out what Huabao does that makes it so profitable – I can't work out what chemicals it makes, what products it sells and why it manages to do so with much less research and development than Givaudan (or International Flavors and Fragrances). Still Huabao must be real. You see it is audited by Price Waterhouse Coopers, it is not a reverse merger and it is listed on the Hong Kong Stock exchange – and we know that the HKSE is far more honest than the reverse mergers in the US. Mr Charles Li, the CEO of the HKSE told us. So – if any of my readers know more about the flavors and fragrances business than you can get from reading Wikipedia and a perfume label and looking at Alibaba will you let me know. Meanwhile – on the basis I can't understand any of this I am short on behalf of my clients. Super-fat margins in a chemical company almost devoid of research and development does not sound very sustainable to me. My readers are a clever lot – so if you can help me, or talk me out of this position I would be thrilled. Post scripts: Some commentators have suggested that this company is a reverse merger - going public via the back door in 2006. I have not checked. Also some commentators have suggested that Trichloromethyl Sucrose is the sweetener known in the US under the brand name "splenda". The 8000 times as sweet as sugar statistic sort of matches - and splenda has three chlorine atoms in the structure so cold be "trichloro" as per the name. But I am not sure where the methyls (ie CH3s) come in. There is a structure illustrated here.